In an emotional night marked by coaching legend Zeljko Obradovic's return to Athens, Panathinaikos Athens registered a pivotal win in Group E by downing Fenerbahce Ulker Istanbul 76-67 in the Greek capital on Thursday. Panathinaikos improved to 6-5, stayed in playoffs territory and gained the tiebreak advantage over Fenerbahce, which dropped to 5-6. Mike Bramos led the winners with 23 points on 7-of-8 three-point shooting. 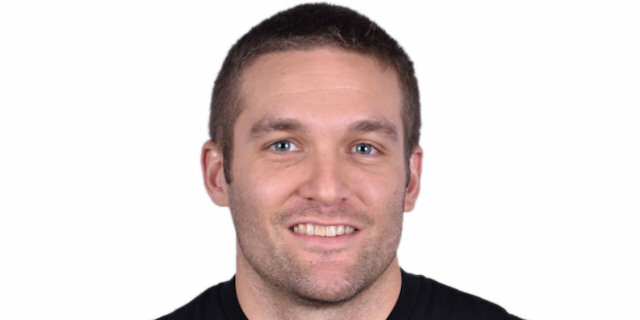 Bramos tied the club record for most threes in a game – which he had already shared with Dimitris Diamantidis – and became the first player in competition history to make 7 triples in a game on three occasions. Dimitris Diamantidis added 15 points, 6 rebounds and 6 assists while Antonis Fotsis and Zack Wright each scored 10 points for Panathinaikos. 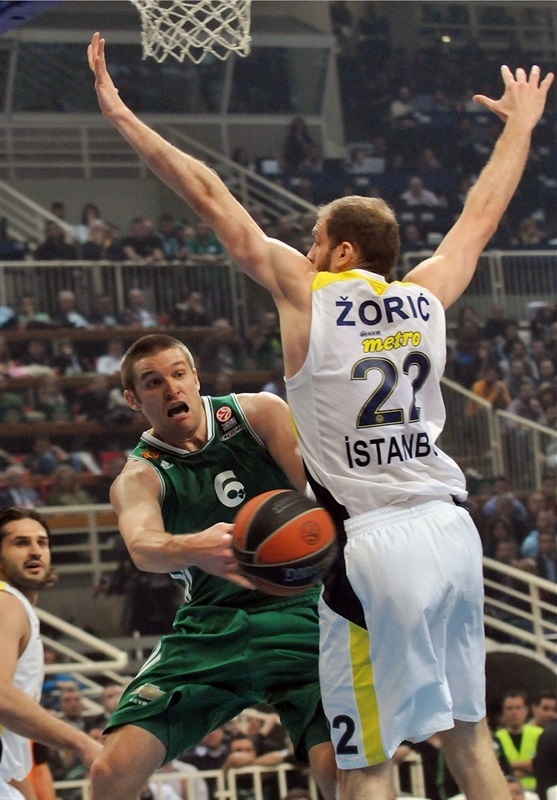 Emir Preldzic led Fenerbahce with 13 points, 5 rebounds and 6 assists. 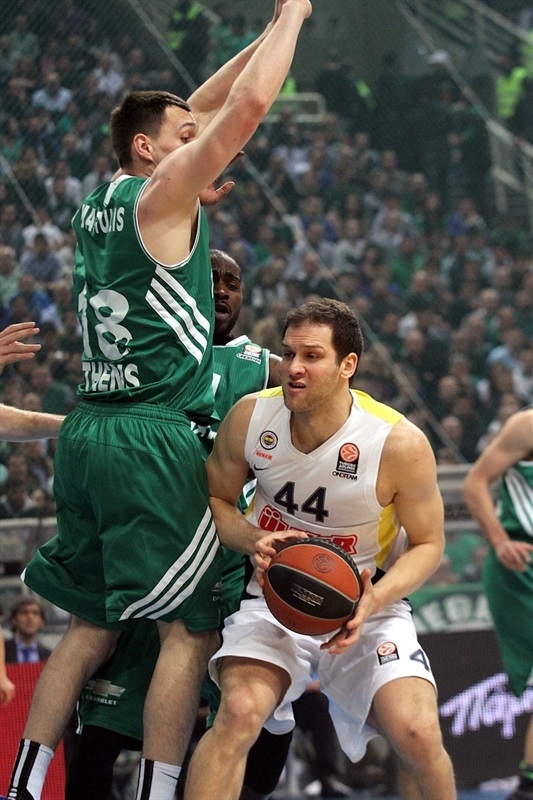 Bojan Bogdanovic added 10 points for the guests. Nemanja Bjelica shined early, getting help from Bogdanovic and Preldzic to give Fenerbahce a 12-19 lead late in the first quarter. 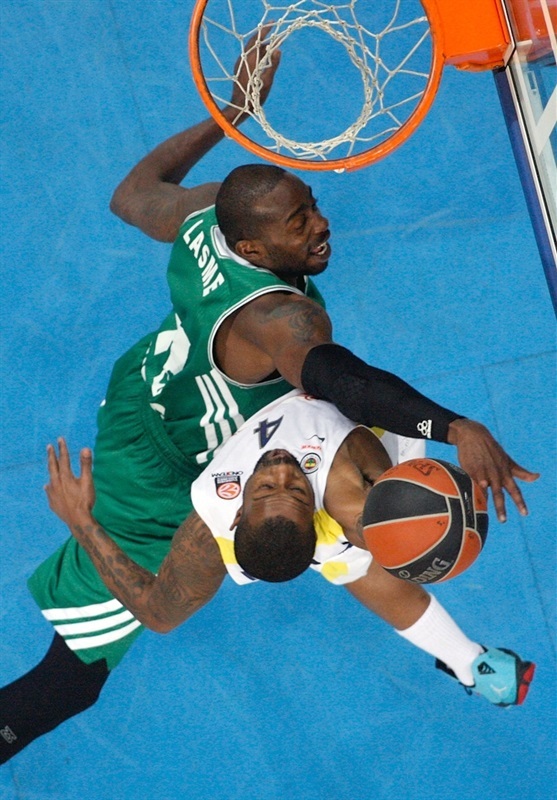 Wright led a 10-0 run that restored a 22-19 Panathinaikos edge soon after that. Wright kept pushing Panathinaikos and a three-point play by Diamantidis gave the Greens a 41-37 lead at halftime. Fenerbahce trailed 50-49 late in the third quarter but Fotsis, Diamantidis and Bramos combined for all the points in an 11-0 run that broke the game open at 61-49. Panathinaikos led 68-53 with six minutes left before Bogdanovic, Linas Kleiza and Bjelica brought Fenerbahce as close as 72-67 in the final minute. Diamantidis hit 4 free throws in the final 33 seconds to seal a key win. 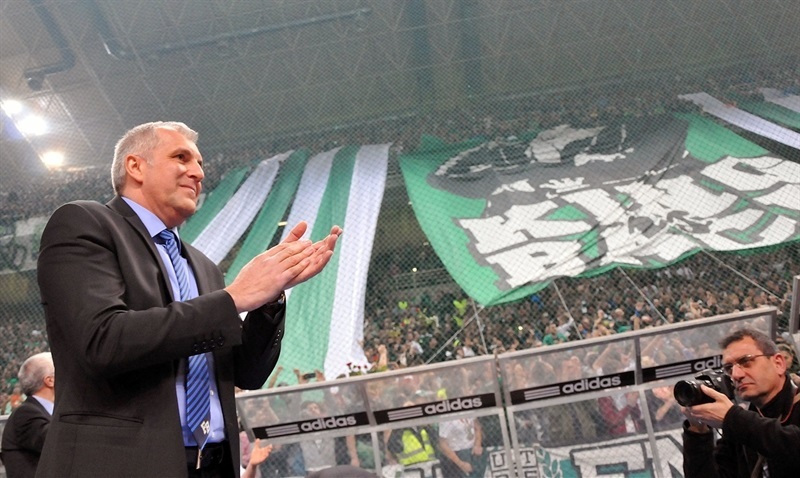 Obradovic was honored in a long on-court ceremony at halftime and a giant banner with a huge picture of Obradovic reading "King is back" was unfurled before the game. Emir Preldzic got Fenerbahce going with an easy basket, but Jonas Maciulis matched it with a turnaround jumper and a three-pointer by Roko Ukic gave Panathinaikos a 5-2 lead. Bjelica answered from downtown and a fast break layup by Bogdanovic put Fenerbahce back ahead, 5-7. Zoric capped a 0-7 run with a layup, Stephane Lasme split free throws before a dunk by Bogdanovic further boosted the guests' lead. Panathinaikos struggled to find open shots after a timeout and a corner triple by Preldzic made it an 8-point game. Bramos joined the three-point shootout and Blagota Sekulic scored around the basket, as Panathinaikos tried a different backcourt with Zack Wright and Dimitris Diamantidis together on court. Fotsis and Bjelica traded three-pointers before a layup-plus-foul on Ukic brought Panathinaikos within 16-19 after 10 intense minutes. Ukic kept pushing Panathinaikos with a driving layup early in the quarter. Fenerbahce struggled to score for more than two minutes and a five-meter jumper by Mike Batiste completed the Greens' comeback, 20-19. 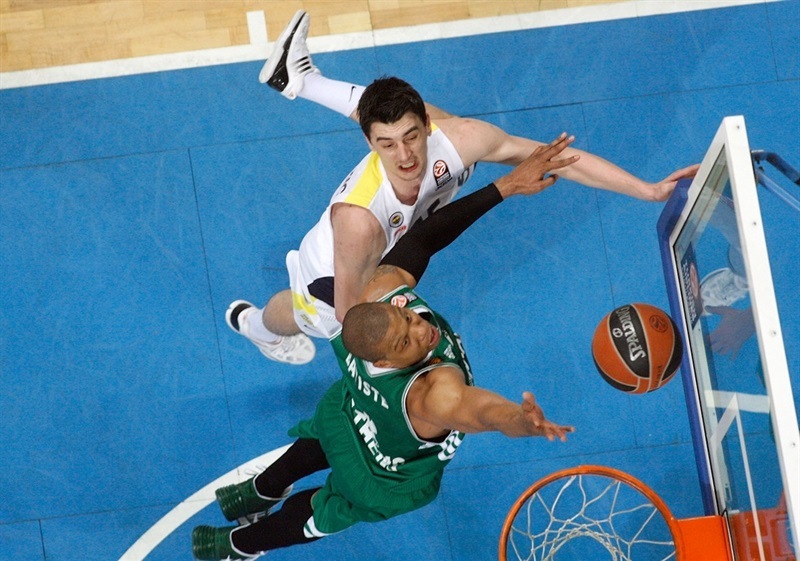 Wright ignited the crowd with a coast-to-coast layup which capped a 10-0 Panathinaikos run. Preldzic stepped up with a layup off a Fenerbahce timeout. Bramos downed a mid-range jumper, but a driving basket by Pierre Jackson kept the guests within 24-23. 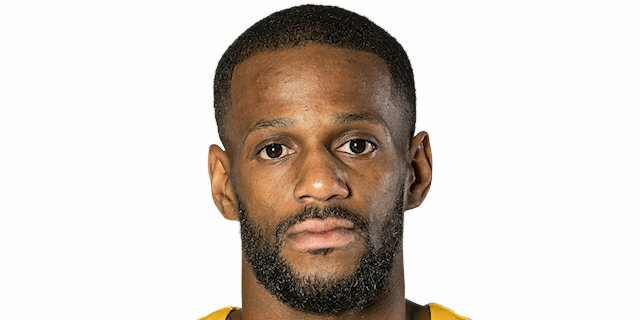 Omer Onan hit an off-balance triple and even though Maciulis answered from downtown, Onan insisted with another triple for a 27-28 Fenerbahce edge. Wright made free throws that Kleiza erased with a four-meter jumper. Onan added free throws. Bramos sank a corner three-pointer and a slam by Wright restored a 34-32 Panathinaikos lead. After Jackson and Bogdanovic made foul shots, Wright scored around the basket and Loukas Mavrokefalidis gave Panathinaikos a 38-35 cushion. A layup by Bogdanovic and a wild three-point play by Diamantidis fixed the halftime score at 41-37. Bo McCalebb followed free throws with a fast break layup to tie the game at 41-41, right after the break. A reverse layup by Preldzic soon put the guests back ahead, 41-43. 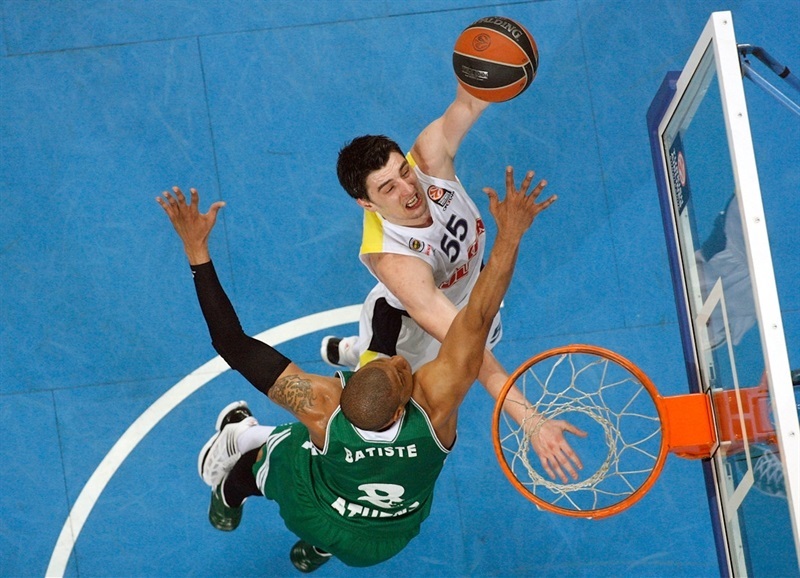 Panathinaikos was held scoreless for more than three minutes until Diamantidis stepped up with a rainbow triple. Bramos also struck from downtown to give the hosts some fresh air at 47-43. Preldzic shined with a big basket in the low post that Bramos bettered with another three-pointer. Fenerbahce did not find answers on offense and brought Bogdanovic back on court. Zoric finished a long, two-chance Fenerbahce offense with a turnaround jumper and a wild driving layup by Preldzic kept the guests within 50-49. Diamantidis made free throws and Fotsis followed a layup-plus-foul with a buzzer-beating three-pointer that gave Panathinaikos a 58-49 margin. Bramos sank his fifth triple in as many attempts to make it a double-digit game, 61-49, after an 11-0 run. McCalebb scored around the basket, but he didn't find much help around. 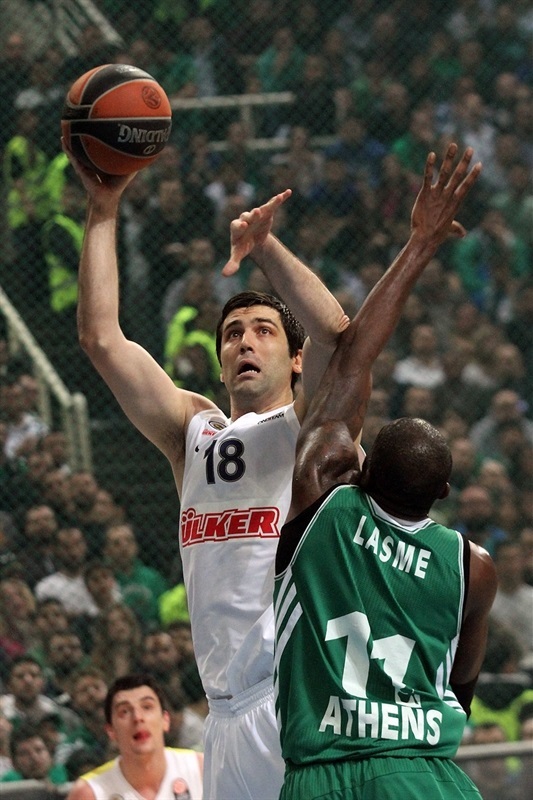 Meanwhile, Panathinaikos, led by an outstanding Diamantidis, kept controlling the game tempo by using long possessions. Diamantidis finished one of those with a driving basket that gave Panathinaikos a 63-51 lead with seven minutes left. Bramos fired in another one from downtown. Kleiza dunked off the baseline and a driving layup by Ukic gave the Greens a 68-53 margin with less than six minutes left. Fenerbahce improved its defense, however, while Bogdanovic and Kleiza brought Fenerbahce within 68-60. 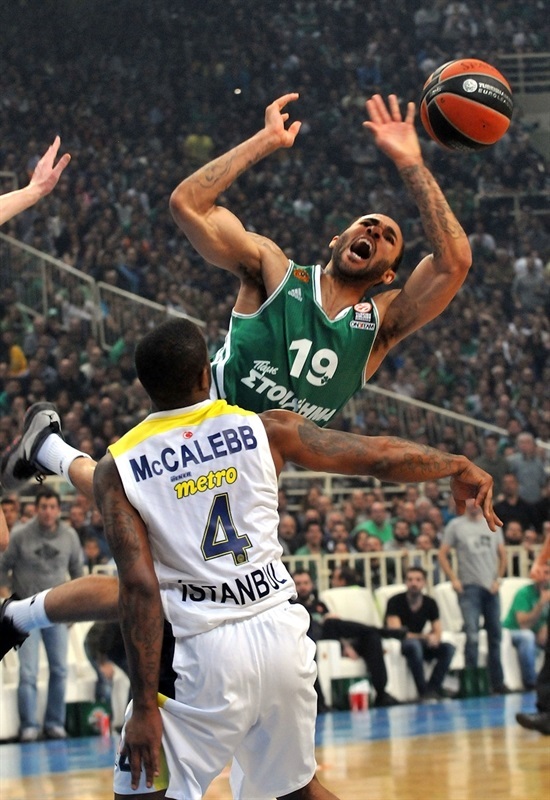 Panathinaikos could not find the way to the basket and free throws by Jackson made it 68-62 after a 0-9 run. After Bramos buried his seventh three-pointer, Jackson hit foul shots and Bjelica struck from downtown to close within 72-67 in the final minute. Diamantidis made 4 of 4 free throws in crunch time, which allowed Panathinaikos to round out a perfect night, getting the tie-break advantage if both teams are tied at the end of the Top 16. "We had and showed a great character and desire to win this game and keep our possibilities alive. Victory is what it counts most, but from the other side Panathinaikos proved tonight why it is considered and really is a great club. I am here for the last 24 years and I know what the Green legacy means. 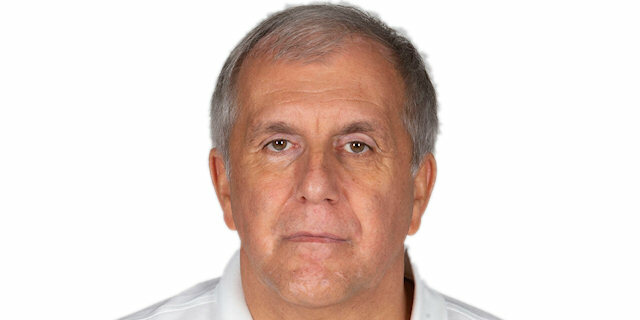 The way we welcomed Zeljiko Obradovic is a real proof of that. There are people who gave their sweat and tears for the glory of the team and they deserve such a standing ovation." "I lived here for the 13 best years of my life and my emotions are very high. I want to thank the Giannakopoulos family, the team and the fans of Panathinaikos for what they did for me tonight. It was very nice to be back, but it was also very hard for me. I feel grateful to all of them and everything I feel and have said, including the Greek phrases, come from the bottom of my heart. From the basketball point of view, Panathinaikos played much better than we did and deserved to win easily, as happened. After this defeat, the situation becomes very difficult for Fenerbahce Ulker and if we will make it to the playoffs, it will be a real surprise. We had a very bad performance and I feel ashamed for how we played in front of so many people on such a special night for myself. " "I made some open shots at the beginning and then it became easier because I found a rhythm. There is no doubt that we got a great and clear win, but it is now over. Our target is to keep improving our game and try to play the best possible next week at Barcelona." " The game was very important for us, especially for our coach, who faced his former team, but unfortunately we didn't cope well and finally lost. One of the reasons for our defeat was the rebounding, where we need to try harder, while Mike Bramos killed us with his three-pointers. In the upcoming games we need to focus more, be more aggressive and try to execute our coach's plan with higher efficiency. "